Janet came up with the exhibition idea after a friend discovered a well on his property when he was building a kitchen extension into his garden. “It was a flowerbed that was covered up. He wanted to go out a bit further and there it was.” He’s made his discovery into a feature. “There’s now a glass disc on it so you can look down into the well,” Janet said. Janet has identified three frequently occurring styles of well in Shaftesbury. “There are some with springs, which are very low down. Others store water like a reservoir – it is held in by the sponginess of the greensand, which allows the rainwater to soak in. And then there are straight wells that just collect the rainwater,” she said. Shaftesbury Estate Agent Chris Farrand says that he has listed properties around the town with wells and hidden water features. “We come across them regularly, often in Enmore Green and Motcombe. They are in all sorts of places, like cellars and gardens,” said Chris. “Sometimes people make a feature of them. They can be hidden and you find a hole in the ground with water in the bottom. We have had clients buy properties and they didn’t know they were there.” Chris says a well won’t add value to a property but it will add to the ‘quirkiness’ of a home. And he reckons Janet will have lots of material to work with. There’s one well that Janet would like to locate more than any other. “I’d like the people who have done the research at the Abbey to say where the Abbey well was. I’d love to know where that is,” she said. Janet wants well owners to reveal details like how deep their well is, whether they still contain water and how far down the water is. “If you have any information from your household deeds and can provide a picture, that would be wonderful too,” said Janet. 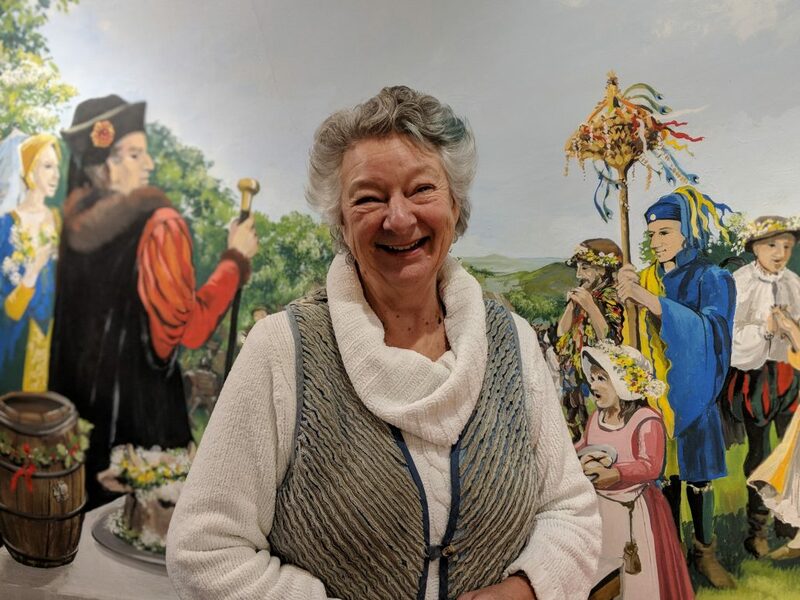 She hopes to receive plenty of information by February, so she can plan the display ready for when Gold Hill Museum opens in March for the 2019 season. Earlier this year, Janet helped to reinstate the Byzant ceremony, where Shaftesbury thanked Enmore Green, down the hill, for offering access to its water. Janet hopes that the spring, at the bottom of Tout Hill, could be renovated in the future. That could provide an additional item of interest for visitors to the town. Janet is also keen to list places where water flows at the base of the hill, where the greenstone switches to clay. The springs are not always in the same place. “They move about a bit,” said Janet. You can contact Janet through enquiries@goldhillmuseum.org.uk.